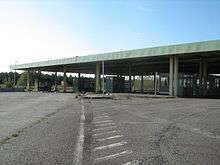 Abandoned former international border control between Austria and Hungary. The removal of Hungary's border fence with Austria in May 1989 was a historic event during the Cold War, directly prior to the revolutionary wave known as the "Autumn of Nations". On 2 May 1989, the first visible cracks in the Iron Curtain appeared when Hungary began dismantling its 240-kilometre (150 mi) long border fence with Austria. The relatively open border with the West allowed hundreds of East Germans on holiday in Hungary to escape to Austria and then travel safely to West Germany. The open border infuriated many Soviet Bloc governments, who feared a return to a pre-Berlin Wall day, when thousands of East Germans fled daily to West Berlin. Although worried, the Soviet Union took no overt actions against Hungary, taking a hands-off approach. The open border meant that it was easier for Hungarians to cross into Austria for goods and services; many Hungarians availed themselves of this to purchase consumer goods which had been unavailable or scarce in their own country; a visible sign of this in the first few weeks was that many cars could be seen in Austrian towns such as Graz with washing machines strapped to them. The most famous crossing came on 19 August, when, during a "friendship picnic" between Austrians and Hungarians, over 900 East Germans rushed the border and escaped into Austria. ↑ Woodard, Colin (10 September 2009), "How a picnic led to the fall of the Berlin Wall", Christian Science Monitor . "Les 20 ans d'un pique-nique qui a fait basculer l'histoire" [20 years of a picnic that changed History], Le Monde (in French) .